The term cerebral cortex refers to the most prominent part of the endbrain as defined by dissection and Nissl stain. It derives developmentally from the cortical plate of the embryonic Encephalon. In the adult human its average volume (two hemispheres combined) is 550 cubic centimeters, and the total number of neurons is estimated at 23 billion. Its surface area in the adult is three times greater than at birth, and two thirds of the surface is hidden in the walls of the sulci ( Zilles-2012 ). In the human ( Mai-2004 ) and the macaque ( Martin-2000 ) it is divided by sulci and fissures into six lobes: the frontal lobe, parietal lobe, occipital lobe, temporal lobe, limbic lobe, and insula. In the rat ( Swanson-2004 ) and mouse ( Hof-2000 ) it is a smooth structure. In the Functional CNS Model - Rat it is one of three components of the cerebrum. The other two are the cortical subplate nuclei and the cerebral nuclei. This definition is the same as the classical definition, except that layer 6b is provisionally classified with the cortical plate nuclei, not with the cerebral cortex ( Swanson-2004 ). The cerebral cortex of primates is classically subdivided topographically into lobes and gyri, on the basis of sulcal landmarks. In functional models it is subdivided into regions and areas of neocortex and allocortex on the basis of internal architecture ( Stephan-1975 ). While primates and rodents share almost no topographic landmarks, most of the architectonic areas of the rodent brain have equivalents in the primate brain. 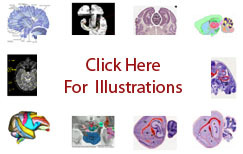 A number of architectonically defined areas of the primate brain, however, have no equivalent in the rodent. Those include particularly areas in prefrontal cortex and at the junction of the parietal lobe, temporal lobe, and occipital lobe of the primate.